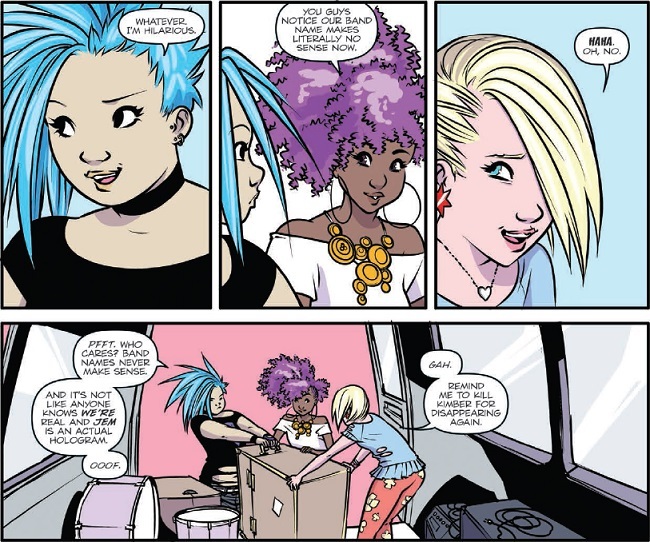 The fourth issue of Jem and the Holograms by IDW shines from the very beginning, showcasing three excellent covers by main artist Sophie Campbell, Marguerite Sauvage and Sara Richard. While Campbell showcases Pizzazz in a selfie shot that squeezes out her bandmates, Richmond depicts a fun scene of rivalry between the two bands, including a Stingers cameo in the corner. Both of these images attest to the playfulness of the series and the personalities of the characters that rule its pages (read: Pizzazz). Meanwhile, Sauvage’s beautiful image – which I would love to see as a print – captures the grace in holographic artificiality of Jem and her bandmates, a reflective play of light and colour. 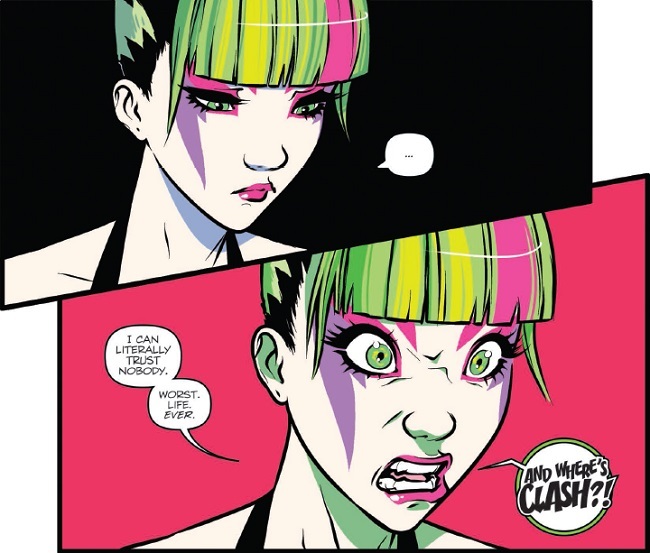 In this issue, as the Holograms and the Misfits prepare for a performance, Kimber and Stormer deliberate over the challenges posed by their relationship, while Clash sets about sabotaging the Holograms first gig. As a whole, it demonstrates the mechanics of each band in a grounded progression, answering questions along the way and entertaining with quick quips and emotional connections. While light in tone, you can feel the series building on previous issues and setting up the wider world for things to come. The art in this issue is very clean and clear, a little more straightforward in its colouring by M. Victoria Robado than earlier issues, but fitting for the business as usual story as it appears in the beginning. 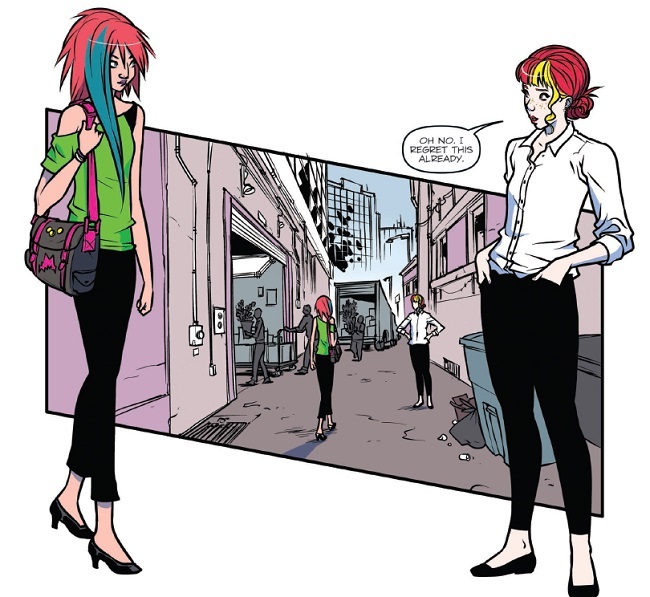 The pastel colours are slightly muted, but complimented by an increase of white in the backgrounds: this very much sets the tone by representing a kind of emotional neutrality that contrasts with emotional moments developing throughout the issue, evident in the sudden shift to blue when Stormer has to inform Kimber that their bands rivalry puts their feelings for each other in competition with their commitment to their music. It’s a technique that really highlights characters’ emotions and motivations as the heart of this series. Meanwhile, Campbell’s art continues to capture the intensity of small moments and simple character interactions. So far, the series relies on a promise of action as it sets itself up, focusing primarily on character and powered by Thompson’s snappy dialogue. However, Campbell’s greatest strength is imbuing what could be seen as expositional scene after expositional scene with aesthetic originality. Characters are never seen in the same outfit or with the same hairstyle, but what’s even more impressive is the design that has gone into crafting so many elaborate and distinct styles. Each item of clothing is realistically purposed as something that could, perhaps should, exist in real life! 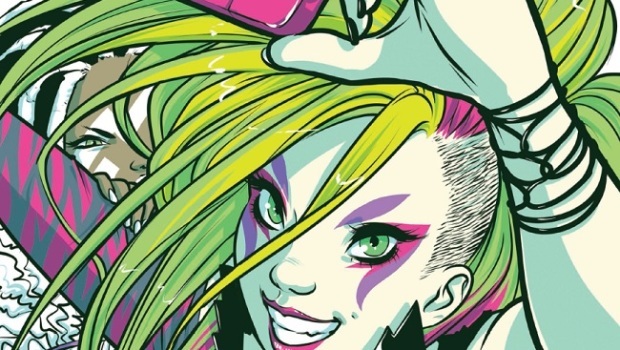 While hairstyle and hair colour are depicted as a little more on the impossible side, it’s with the glam and punk exceptionalism that has always been part of the Jem aesthetic. From here, we witness Pizzazz at her quietest and then as her violent, explosive self. We spend more time with new character, Blaze, an addition that we can expect interesting things from. As of now, she represents a free agent not aligned to either side; all we know of her is that she has a troublesome past with the disruptive Clash. Her ambiguity therefore allows for a lot of story potential, which I fully expect to develop. 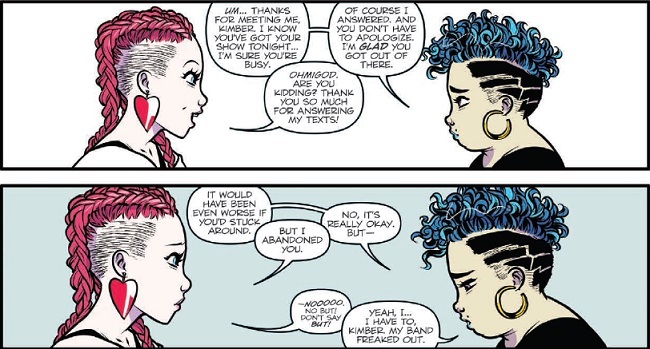 Similarly, the complicated and by no means forestalled relationship between Kimber and Stormer is just a bubbling pot of tension and emotion you can fully expect to boil over! And in our first meeting between Jem and Rio, we get the beginnings of complicated, selfish, uncertain and unavoidable tragic romance, which let’s admit, we’re all here waiting for. This is a comic of gorgeous aesthetic, unique design, emotional impulsivity and playful co-operation (or antagonism) between friends and adversaries. Jem and the Holograms is a radiance of exaggerated proportions set against a background that quietly resembles the real world: the friendships, relationships and rivalries are the driving force of this series. Every issue is an inspiration of style and personality; there can be no doubt at this point that Thompson, Campbell and Robado were the right people for this book. My only criticism that I think impacts on the quality of the book remains in its handling of music. With Campbell’s representation of style, sound and feeling, there is no need for lyrics, especially ones that read as generic in contrast to the unique visual aesthetic. With the delivery set for now, I’d like to see more done with the lyrics to portray songs that I can imagine myself really listening to, perhaps by elaborating on them slightly to give them a more realistic feel. Apart from that, however, nothing else detracts from the lovable experience of reading this book. And with the cliff-hanger of this month, we have some good old-fashioned action and adventure to look forward to next issue, which is set to be an interesting change of pace.